Not only do they not currently make them like Elaine Stritch, they never did. A legend of the screen and stage, Stritch is that rare specimen of human, a tireless soul who can’t seem to shake the limelight, even when she finds it harder and harder to muster up the strength and courage to walk back on stage and deliver another winning performance. In Elaine Stritch: Shoot Me, Chiemi Karasawa chronicles the year when Stritch appears to be on the verge of officially calling it quits at the age of 86, leaving New York City behind in order to return to her home state of Michigan. Yet before she does that, more rehearsals, more work, and, yes, more performances await her. Stritch’s career is so long-running and wide-reaching that we needn’t get into specifics here. Suffice to say, she’s won a Tony, she’s won an Emmy, and she’s appeared in more films and stage shows, and on more television, than seems possible for one individual. 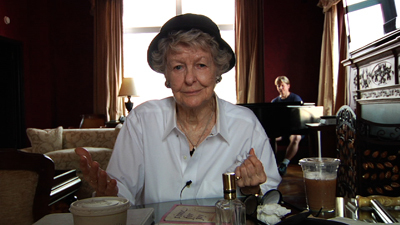 A first-time feature director (she has previously produced many excellent docs), Karasawa reveals Stritch’s life story with an impressive deftness, preventing the film from devolving into another staid, generic bio-doc. That’s largely in part to Stritch herself, who might be older than she ever was, but in the present day remains as ferociously alive as she’s ever been. Though Karasawa includes the now-seemingly-mandatory celebrity testimonials common to this sub-genre and recruits such noteworthy faces as Alec Baldwin, Cherry Jones, Tina Fey, John Turturro, and James Gandolfini (who delivers perhaps the best zinger of all), and while this remains without question a lovely and loving tribute to Stritch, at no point does Karasawa ever resort to fawning. Again, this might very well have to do with Stritch herself, who’s as sensitive as she is hard-nosed. As we get to know her more intimately over the course of these 80 minutes, it’s clear that she couldn’t keep her warts covered if she tried. Yet when she discusses honest the loss of her husband and her crippling love of alcohol, those warts disappear. While watching Elaine Stritch: Shoot Me, I confess that it was virtually impossible for me not to think of another recent IFC Entertainment release: Ricki Stern and Annie Sundberg’s Joan Rivers: A Piece Of Work. But in this particular case, it’s not a situation of “comparing” these two cine-portraits. It’s an instance of them complementing one another so very well. More than being refreshingly intimate glimpses into the lives of two show business legends, taken together, these films are bracing, eye-opening lessons in what it truly takes to succeed and survive in the world of entertainment. Talent is a must, yes, but more importantly, one must have been blessed/cursed with an inexhaustible work ethic and a tireless creative drive. It is an equally inspiring and deflating experience to witness Elaine Stritch perform in front of audiences even when she knows she’s going to forget some lyrics along the way. Yet whenever this happens, she manages to wring humor and humanity out of the situation. That’s entertaining!